These six leaves served once as pastedowns before they were detached from their host volumes. Certain is that f. 1 was a front pastedown in Cod. 3745, and that f. 3 and f. 6 pastedowns in Cod. 3691. The bindings from both manuscripts are products of the Mondsee binding-workshop. 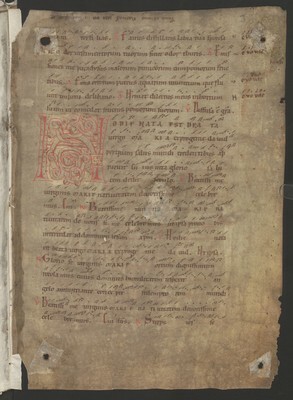 From this antiphonary survived the following group of fragments: Wien, ÖNB, Cod. 660, Cod. 732, Cod. 927, Cod. 1355, Cod. 1707, Cod. 1985, Cod. 3628, Cod. 3671, Cod. 3691, Cod. 3745, Cod. 3781, Cod. 3892, Cod. 15436, Fragm. 557, Fragm. 579, Fragm. 603, Frag. 604, Fragm. 613, Fragm. 906, Fragm. 954, Fragm. 960 (Klugseder 'Gruppe NNA1').